When using SharePoint Designer 2010 to connect to a SharePoint and SharePoint online website, the application prompts the user to login for the first time. After the user has logged on once, the application caches this information and automatically logins to the website the next time you try to open the website. This is a desirable feature, but there is often the case when we want to login as a different user, and SharePoint Designer continues to auto login with the credentials already cached. If you click on the icon, the application displays a dialog indicating that you are logged on as a particular user and if you want to login as someone else. Click ok, and enter the new credentials. This should allow you to login as a different user, and you can go on with your tasks. The pages folder is already set up with public permissions. This allows the site to be visited by non-authenticated users. The pages on this site are created with the root.master page. This master page can’t be modified to brand our site. The main reason is because there is a WYSIWYG editor available for these pages that allow you customize the site with predefined styles and themes. Any attempts to modify the root.master files would cause the website to break. How do I brand my Office 365 website? Use the default public website with the default themes and styles right from the browser. This is the easiest approach, and it will deliver a basic website design with a basic layout and theme. You will be able to add a header, footer and navigation menus. We can also change the layout structure by adding different zones to the page. We can also add page title, description and keyword Meta tags to aid on SEO. Most people are really not happy with the results they get from this option. When the first two options are not providing all the flexibility you need, you can now start using SharePoint Designer. This is a developer tool that allows us to open an Office 365 site and have more control over the design of the site. We can open the website pages with this editor and fully customize the HTML (within the Container tags that are required by the master page). Once we start doing customization at this level, the WYSIWYG editor on the browser will no longer work. This approach makes designer and developers happy because there is more control on the design and folder structure of the website without the need to know SharePoint specifics. If you are ready to move away from the root.master file, this is the approach for you. With SharePoint Designer, we can attach pages to a different master file. This master file can be customized to meet all of our design needs. For example, we can create a HTML5 master template with all the branding requirements and attach the new pages to this new master template. This however increases the complexity level because your master page needs to meet a few requirements to be a valid SharePoint master page. At this level, SharePoint knowledge starts to become a dependency. There are however a few basic templates that can be used as a starting point. Office 365 allows us to create sub-sites which are created private by default. We can however change the access setting and make it public. Once we make a sub-site public, we can set any page in the sub-site as the site home page (this is a global site setting). This tells SharePoint that when a person navigates to your domain http://mydomain.com that the browser should be redirected to the home page which now resides at the new sub-site. This is how it works for the default public website. SharePoint basically redirects users to http://mydomain.com/pages/default.aspx. For a sub-site, SharePoint redirects the users to something like: http://mydomain.com/sitepages/home.aspx. With this approach, you now need to know more about SharePoint administration and development. The benefits are that we can now integrate SharePoint features to the public website. For example, we can display a document library, calendar, lists, custom web-parts and custom business solutions. For public users to create new records in a list, you will need to explicitly provide public write access to that list. The main difference between SharePoint on Premises and online is that you can only deployed Sandboxed solutions on the online edition. A Sandboxed solution is isolated, and SharePoint will block it if the solution starts to become unstable. The reason behind this is because this is a Multi-tenant environment, and it is not convenient to have one tenant’s solutions affect other tenant’s sites. This also implies that certain resources are not available for a Sandboxed solution compare to a Farm Solution which limits what you can do for your custom solutions. SharePoint branding is not as easy as a normal HTML website, and depending on your skill set, you may choose any of the listed options above. If you are not familiar with SharePoint, you may want to partner with a company that has this expertise. I hear from many designers and a developer how frustrating is to work with this product, but like anything, certain level of expertise is required to know how to work with a particular technology. 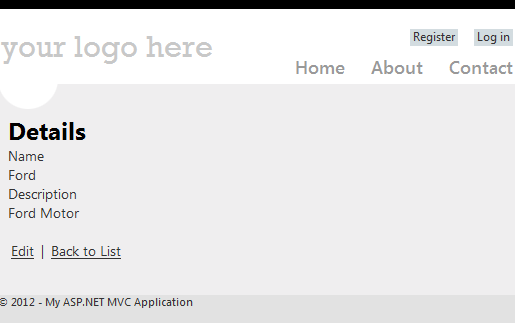 I hope I was able to show you a few approaches on how to brand your SharePoint public website. In this case, we added the Address type as another possible type which should be included during the serialization. I hope I was able to help you understand why this exception is raised when serializing complex objects and show you a way to handle the problem. This is often caused because we tend to use a dev or expired certificate which is actually not valid and causes an invalid certificate exception that drops the communication with the server. To address this on the dev environment, we need to add a certificate policy that can handle the invalid certificate. With the SetPolicy call, we added a policy to validate the remote certificate. In the case of an invalid certificate and with no policy, this usually creates an un-handled exception which terminates the communication. With this policy, we handle the validation of the certificate and return true to ignore any invalid certificate exception. This policy should only be used on dev environment. In production, the certificates should be valid for the most part. I hope I was able to show how to handle this exception and manage invalid certificates on your WCF service. This is the layer that contains the custom assemblies with the implementation of the service contract, security policies and custom user validators. This is the XML that resides in the app/web.config file. It contains all the elements that are needed to configure a WCF service with its endpoint, binding and behavior configuration. Each one of these elements can also contain other elements to further define the communication details, security and behaviors for the service. This diagram provides a simple visualization of the main elements and their association. The site template requires that the feature be installed in the farm or site collection. This message is usually generated when we try to create a new site from a site template, but the site template was built as a Sandboxed solution and depends on a site scope feature which may not be active or does not exist. To address this issue, open the SharePoint solution on Visual Studio 2010 or 2012. We should now look into the WebTemplates folder and open the ONet.xml file. Look at the Configurations -> Site Features settings. 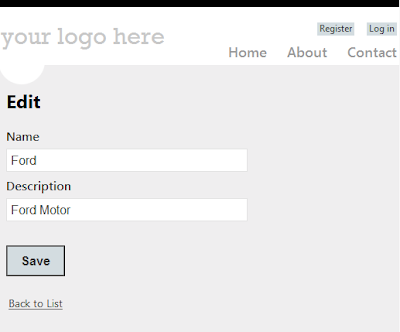 Look for a custom feature that may be included there, and you may need to install on the site. If this is the case, you need to install that feature first or include it in your project, so it will be activated during the activation of the site template. If your web template does not need that site feature, you can remove it from the ONet.xml file all together. You just need to make sure that the feature is not a dependency in your project. You can now build and package the solution again. We can now go back to SharePoint to deactivate and delete the previous solution. Upload and activate the new solution. You can try to create a new site with the new site template, and the error should not be raised anymore. 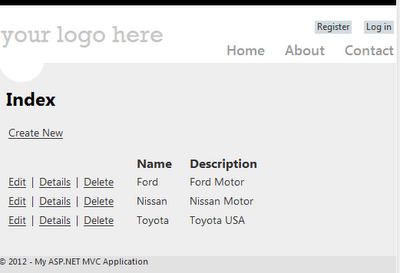 With ASP.NET MVC and Scaffolding, we are able to code first and create the database objects from the model. This approach basically allows us to create the model classes (implementation). We can then use Scaffolding to create the controller, view and database objects with code generation. This however is not as straight forward when we use the Database first approach in which we design our database first and then we want to create the controller and view. 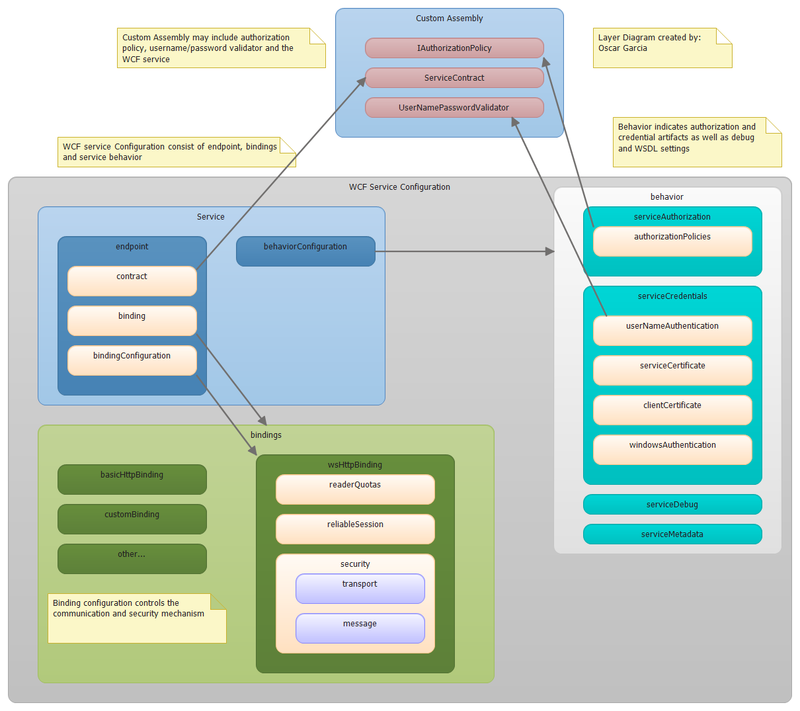 We are going to walk through this scenario to see how we can achieve this with Scaffolding and the Entity Framework. This is the table that we will use for our application. We will create the entity model, controller and views without writing a line of code. Click on Code and select EF DbContext Generator. If you do not see this option, click on Online Templates and install the template by selecting Entity 4 or 5 DbContext Generator. This is determined by the version of the Entity framework you have installed. We just replaced the code in the edmx designer class with code generated in tt files. You should have two files one with ModelContext.tt and Model.tt. The TT extension stands for Text Template. This is the T4 technology that allows us to generate code using templatesa, and this is not just for MVC projects. The model context file contains the database context class of type DbContext. The model tt file contains the entity model for the table. 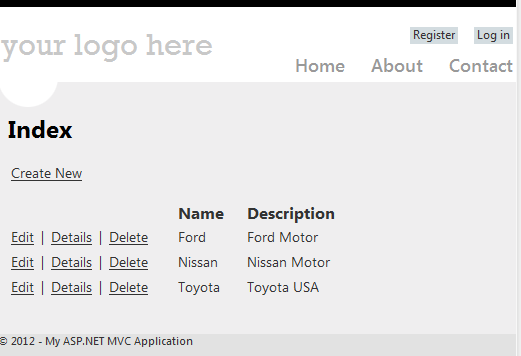 Scaffold Controller VehicleMake -force -repository -DbContextType "CommerceEntities"
In this command, we are telling our code generation to create a controller and view based on the VehicleMake model. The –force switch is used to overwrite any previous files. The –repository switch is to create a repository interface that would be used by the controller. This facilitates for a dependency injection approach which avoids having a tightly couple implementation of the entity object in the controller. The –DbContextType is to tell our code generation that when the repository class is created it should use the DbContextType that was created when we converted the entity classes to type DbContext. In our case, it is the CommerceEntities. 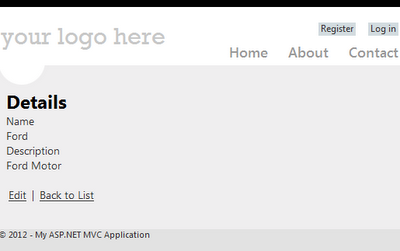 If this parameter is not used, the code will be generated with a type of MVCContext which is not our entity context. PM> scaffold controller VehicleMake -force -repository -DbContextType "CommerceEntities"
You should notice how the controller uses the repository interface as the parameter in the constructor. This allows us to use dependency injection and separate the model operations from the controller. The controller uses the repository for all the data/model tasks. For the views, we have the index, edit, create, delete and details views which can be used for the CRUD operations. These views and controller can be enhanced to meet your application requirements. These views may not have a great design, but the objective here was to show how we can create a running application with no implementation effort at the application level. We can see the records that were added during our database creation step. From these views, we should be able to add, edit and delete records, and the changes will be reflected in our table. I hope I was able to show you how to leverage Scaffolding and the Entity framework to accelerate your development process. We started with a database model, use some code generation templates and created a simple application in a short time. Exception Details: System.Data.MetadataException: Unable to load the specified metadata resource. That indicates that those files are embedded as a resource in a different dll. I hope this provides some help in resolving this metadata exception.